We are often told to moisturize every day, but recent science tells us why it is so important to moisturize to keep our skin healthy. In fact, a recent study suggested that barrier repair moisturizers may prevent inflammatory diseases like diabetes, Alzheimer’s and heart disease. Why Is an Impaired Skin Barrier Bad for Your Health? Is Aged Skin More Likely To Have Inflammation? Inflammation is more common in older individuals. Damaged, dehydrated, or aged skin also plays a role in inflammation. Aged skin has been shown to have more inflammatory cytokines, which are markers for inflammation, as compared to younger subjects. This could be due to the fact that aged skin is more likely to have a barrier defect leading to increased TEWL (transepidermal water loss) or a higher pH–both which have been associated with an increase in inflammatory cytokines. The same authors showed that improving epidermal functions in chronologically aged mice skin lowered serum levels of inflammatory cytokines. Cytokines are signals that cells use to communicate with each other throughout the body. I like to think of cytokines as a language. Some speak a proinflammatory language, while others are language signals that calm inflammation. In other words, not all cytokines are bad. When inflammatory cytokines are released, they activate inflammatory pathways, creating a domino effect of unwanted health and skin problems. The cytokines called IL-1β, IL-6 and TNFα are the proinflammatory cytokines that are known to be associated with age related diseases including cardiovascular disease, Alzheimer’s disease, and type II diabetes. Inflammation Increases the Risk of What Diseases? For years, we have known that inflammatory diseases such as rosacea increase the risk for cardiovascular heart disease, diabetes, inflammatory bowel disease, dementia, and other diseases. The inflammatory diseases cause these other diseases by increasing amounts of proinflammatory cytokines, which lead to more disease. What Causes an Increase of Proinflammatory Cytokines? It is known that excess fat tissue, more common in older people, is associated with increased inflammatory cytokines. However, a 2019 study postulated that characteristics of aged skin, such as an impaired barrier and an increased pH, could lead to an increase in inflammatory cytokines in humans, as had already been seen in mice. This study had already shown that “barrier disruption induced a significant increase in the mRNA levels of IL-1a, IL-1b, IL-17F, IL-19, IL-22, IL-23, and TNF-a in the epidermis, and up-regulated expression of these cytokine mRNAs in the dermis”. Why Are Barrier Repair Creams Important? This study found that using a properly formulated barrier repair cream containing MLE technology (such as Zerafite Body Cream) helps to reduce the amount of inflammatory cytokines found in the blood, thus reducing inflammation in the skin and body. The study suggested that use of a MLE technology containing barrier repair cream might lower the risk of Alzheimer’s disease, cardiovascular disease, dementia, diabetes, and other inflammation-associated disorders. Patients who suffer from the inflammatory disease eczema benefit from using a barrier repair moisturizer that uses MLE technology to replenish the skin with the proper ratio of lipids, ceramides, and cholesterol. 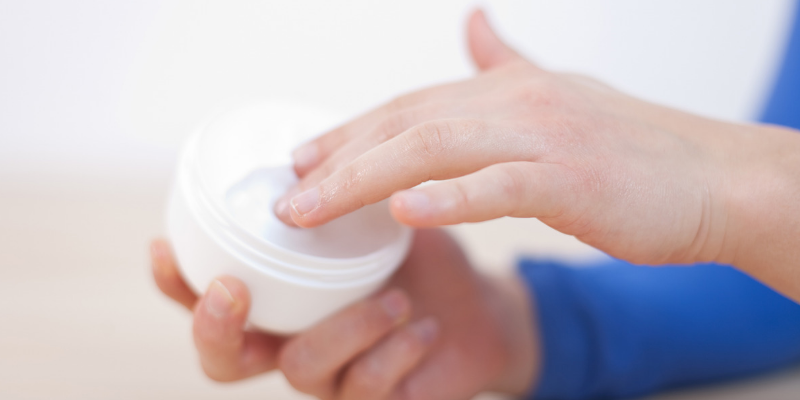 This new study suggests that use of a barrier repair moisturizer reduces the risk of generalized inflammation that can lead to other diseases such as heart disease, dementia and diabetes. We know that there are many factors that play a role in inflammation, such as the microbiome, but this latest study suggests that one easy daily step we can take to improve our health and prevent common diseases is to use a barrier repair moisturizer such as Zerafite Ultra Rich Body Cream. This product uses MLE technology to mimic the natural ratio of fatty acids and other lipids present on healthy skin to strengthen the skin barrier, keeping irritants out and moisture sealed inside. Zerafite products can only be purchased from a physician using a specific code. You can get a code from a Skin Type Solutions physician partner or, if there is not one in your area, you can use code ZERA19 at SkinTypeSolutions.com for a limited time. We can’t say for sure just yet that using a barrier repair cream could directly prevent or treat other inflammatory diseases such as Alzheimer’s, heart disease, or diabetes. But we now know that there is a link between skin inflammation and inflammatory cytokines throughout the rest of the body. So using a barrier repair moisturizer may help to increase your heart health, brain health, and skin health. If you’d like to learn more about the findings of this exciting new study or have questions about what type of moisturizer to use on your skin, find and follow Baumann Cosmetic on Facebook, Instagram, and YouTube or email our Miami office at info@derm.net.